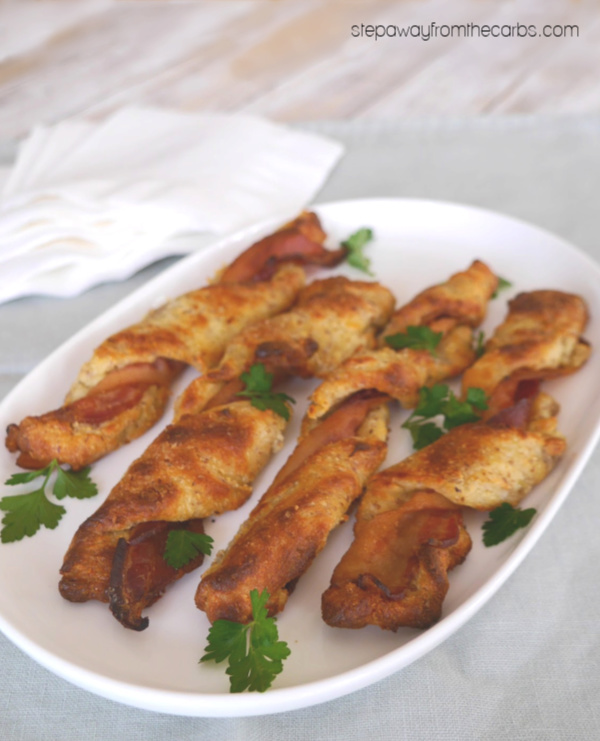 These low carb cheese straws are extra delicious due to the addition of bacon! 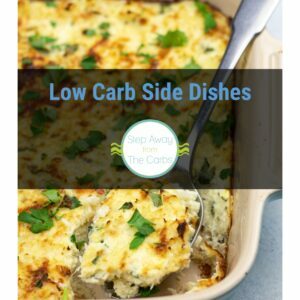 Keto, LCHF, and gluten free recipe. OK. I admit it, I’m rather obsessed with FatHead dough. 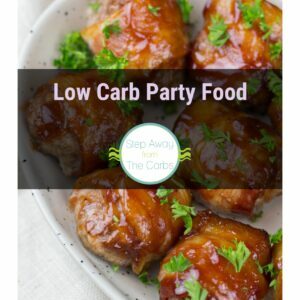 I may be late to the game, but I’m making up for it with a huge variety of ideas and ways to use this low carb high fat dough. 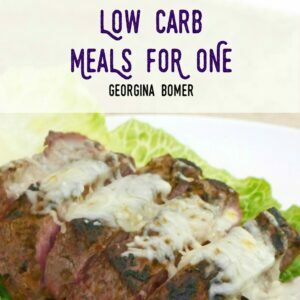 You can read all about it in my Ultimate Guide! 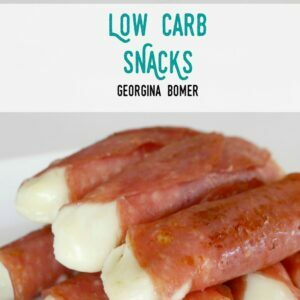 So here’s my next creation – low carb cheese straws! 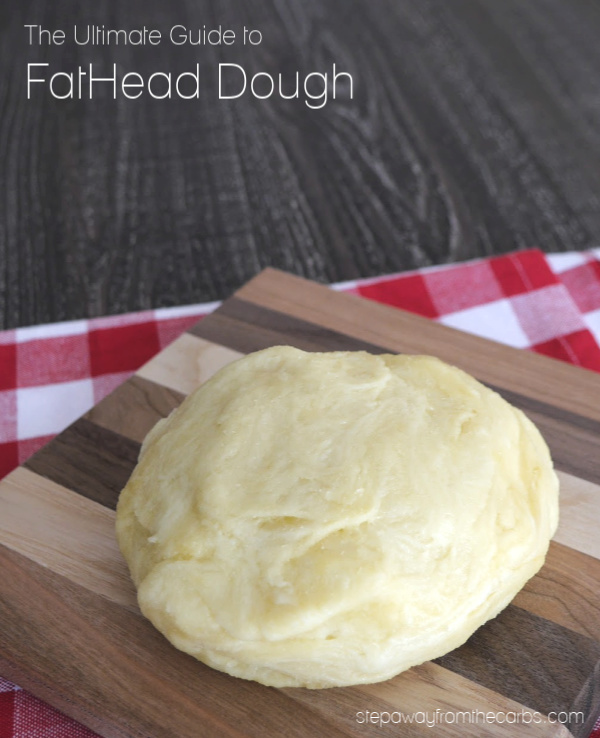 FatHead dough is quite cheesy to start with, so it’s a great starting point. 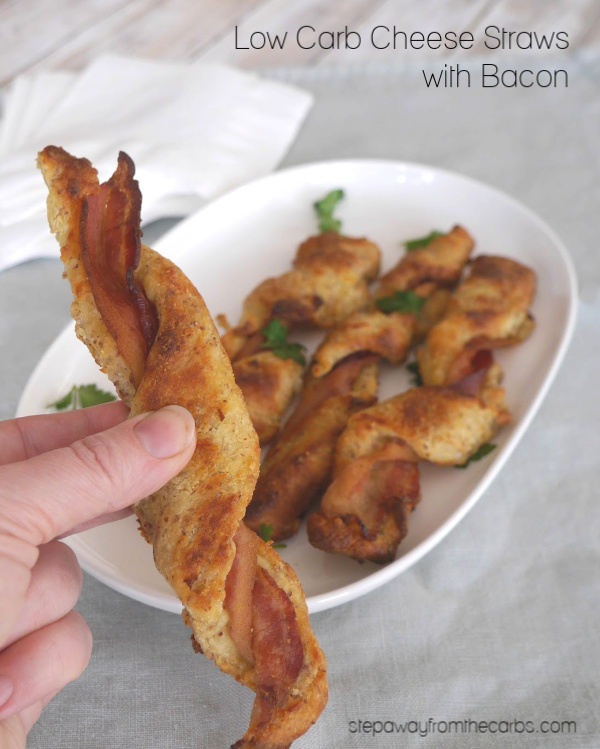 But then when I decided to add bacon to them – things got even better! Once you’ve made the dough (see the recipe card for details), place it on a large silicone mat. You need to roll it flat and you could probably do this with parchment paper and a rolling pin – but I confess that I just use my fingers to smoosh it into a rectangle! Place eight slices of COOKED bacon side-by-side on the dough. I haven’t tried it with raw bacon but I think that FatHead dough cooks too quickly and will burnt before the bacon is cooked through for this particular recipe. I’m currently buying huge packs of cooked bacon from Costco – if you have one near you check it out – which means I always have bacon ready to go! 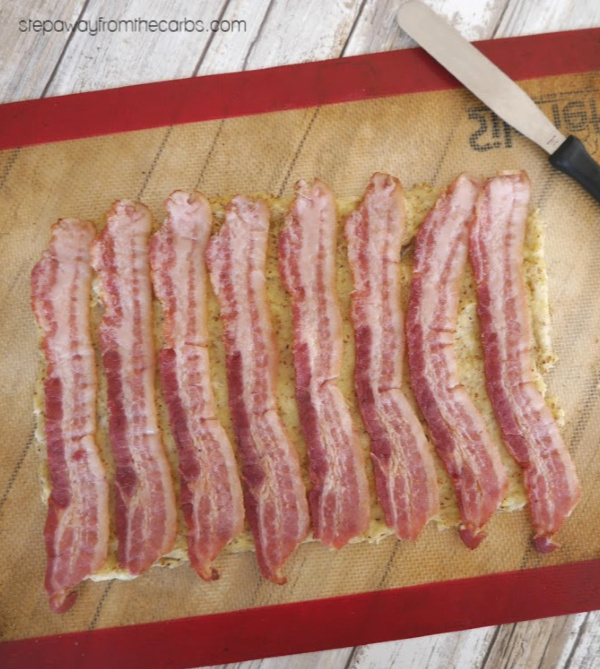 Use a palette knife (or something similar) to score lines between the bacon. 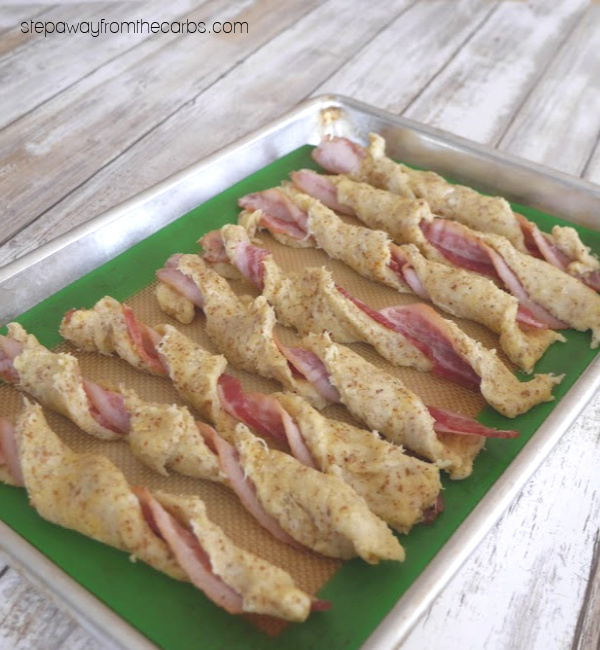 Then pick up each strip of dough and bacon, and twist them around into the classic cheese straw shape. Place them on a baking sheet lined with (another) silicone mat. By the way – I happened to have unblanched almond flour in stock when I made these, which is why the dough looks kind of speckly. 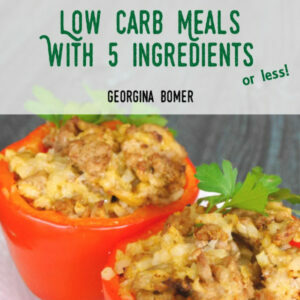 But it’s not necessary for the recipe – any fine almond flour will work OK! 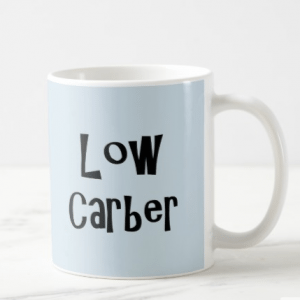 Brush the low carb cheese straws with a little melted butter, then bake in a preheated oven for 15 minutes, turning half way through the cooking time. Let cool for five minutes, (you might like to place them on a piece of paper towel if they look too greasy – it depends on your bacon! ), then serve warm, garnished with fresh parsley. These are great to serve at parties for a tasty snack – and they’re actually quite filling! Place the mozzarella and cream cheese in a medium size microwaveable bowl. Microwave for 1 minute, stir and then another cook for another 30 seconds. Stir in the beaten egg and almond flour, and season with salt and pepper. Let the dough cool slightly, then knead until smooth. Add a little extra almond flour if the dough is too sticky, then knead again. Place the bacon side-by-side on the dough. Use a palette knife (or something similar) to score lines between the bacon. 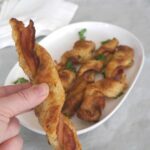 Pick up each strip of dough and bacon, and twist them around into the classic cheese straw shape, and place them on a baking sheet lined with (another) silicone mat. Brush the low carb cheese straws with a little melted butter, then bake in for 15 minutes, turning half way through the cooking time. Let cool for five minutes, (you might like to place them on a piece of paper towel if they look too greasy - it depends on your bacon! ), then serve warm, garnished with fresh parsley.